Replacing the windows in your home sounds costly, but one of the advantages of Thornbury vinyl replacement windows is their relatively low cost. In fact, they are one of the least expensive choices when it comes to buying replacement windows. And because of the higher energy efficiency of replacement windows, they wind up paying for themselves in a few short seasons. At Windows Plus, we conduct each and every Thornbury replacement window installation with the idea that every replacement window is truly an important part of your home. From the very finest raw materials to an uncompromising commitment to quality and craftsmanship…our goal at Windows Plus is simple: To be the finest Thornbury replacement window company for all our customers. Windows Plus is the premier source for NFRC rated Energy Efficient Thornbury replacement windows and vinyl siding. At Windows Plus, we use Generations® Thermal Core Siding as our vinyl siding choice. This brand of vinyl siding features a permanently laminated insulating backing for unbeatable performance. So not only will the exterior appearance of your home improve, but our vinyl siding installation will also help improve your Thornbury home's energy efficiency. 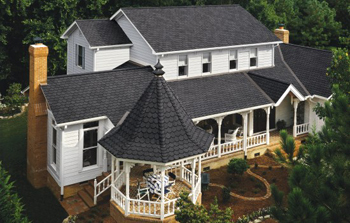 Proper care and maintenance of a roof is essential to ensure its longevity. Care of a roof includes removal of dirt, debris and snow from its surface from time to time. A careful inspection of the roof is warranted periodically and an internal inspection of the wall and the attic close to the roof is required more frequently. Besides personal inspection by the homeowner, it is also advised to consult a professional Thornbury roofing contractor from time to time in case the occurrences of a leak and such symptoms are reported frequently. If you live in Thornbury and you're looking for professionally installed Replacement Windows, Doors, Vinyl Siding or a great Roofing Contractor, call Windows Plus today at 610-572-4733 or complete our online request form.